This Sign Display is EIGHT FEET TALL! Large 22"w x 56"h Snap Open Frame Included! 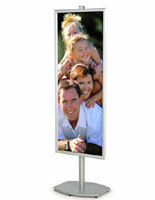 Simple, Elegant Ad Stand at an Attractive Price! This sign display helps your message stand out! EIGHT FEET TALL with a large 22"w x 56"h Snap Open Frame! 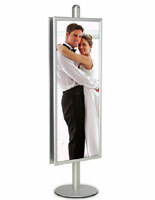 This sign display is manufactured with sturdy and durable aluminum with an attractive brushed finish. 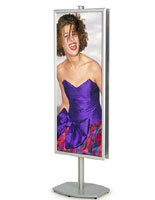 The sign display, also known as a poster holder, comes with one 22"w x 56"h clip frame. 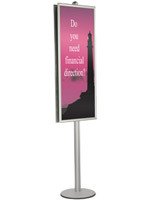 This large display stand helps your graphic capture attention in large or crowded areas. 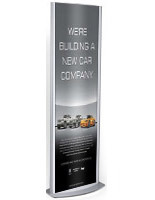 Towering above other sign displays, this 8ft tall display sign makes a noticeable impact at a low impact price! 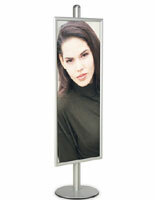 These sign display units work best in large indoor areas with high foot traffic. This display sign is best suited for building entryways, bank foyers, large retail stores, shopping malls and building and hotel lobby areas. 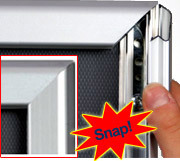 The snap frame is designed for quick and easy graphic changes. Simply snap open all four frame sides, place the graphic media beneath the clear plastic lens and snap the frame sides closed. The clear lens protects your sign and is non-reflective. Poster frame installation and height adjustments are simple using the connector plate screws on the back of the picture frame. 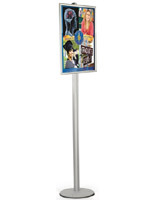 These 8 ft. sign stands ship unassembled and go together in minutes using the assembly instructions provided. 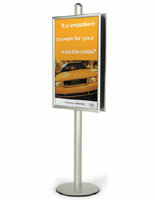 These sign stand products are versatile and very cost effective advertising tools.